Back in February I went to see Billy Bragg (@billybragg) play at an event organised by The People’s Assembly (@pplsassembly) against the Coalition governments austerity policies. The event on the whole was amazing, Billy was awesome as ever, The Farm (@TheFarm_Peter) did a guest spot, a fantastic local Manchester band (the name escapes me, if you know it please let me know and I’ll ammend) opened the show and I discovered an artist who has fast become one of my favourites. Her name is Grace Petrie (@gracepetrie) and she plays a politically fulled folk punk style (check out her website here). Her set in the night blew us away and the next day I ordered a CD of hers entitled “Mark my words” which has rarely left the CD player of my car since. The whole family love it, to the extent that while most 2 year olds walk around singing “Twinkle Twinkle” or “Let it go” mine sings “The revolution will not be televised” and “Emily Davison Blues“! Mark my words is a phenomenal album, and I’d suggest everyone give it a listen and purchase a copy. A few weeks later we ordered “Tell me a story” which is another superb album, and the song “Farewell to welfare” contains some of the most mature and poignant lines I’ve ever heard in any song. Which is quite amazing considering Grace must only have been in her early 20s when it was written. This weekend an eagerly awaited package fell through the door. It contained “Whatever’s left” – Grace’s brand new album, and one she promised was her most political yet. It is a stark commentary on the life of a young person in Coalition Britain and certainly suggests a worrying future now the Tories have everything their own way. The song “Revolutionary in the Wrong Time” alludes to the decline in workers rights we’ve seen and how toothless we are to protect what little we have left – “I heard a rumour there was power in the Unions but that was yesterday.” And that was written before the tories started their new attacks. The songs “Overheard” and “I do not have the power to cause a flood” speak out against the bigotry and inequality that is unfortunately all too rife in today’s society. The title song “Whatever’s left” encapsulates Grace’s anger at what has gone and is perhaps summed up best with the line “It’s like a bad dream, when I see the mess that the bastards made of the NHS”. As with the other two albums, it’s not all political songs, and “Ivy” written about her new born nice is an amazing ode to family and love. As with the other 2 Grace Petrie albums I own, I cannot fault a single song. The album is fantastic from start to finish – and in my opinion even better than its predecessors. If you’ve never listen to Grace, I urge you to do so. She’s a phenomenal talent, with an inspirational world view who’s doing it herself, without a label of any sort, in true punk style. Posted on June 15, 2015 June 15, 2015 Categories Austerity, Equality, Music, UnionsTags Album Review, Grace Petrie, Music, The People's AssemblyLeave a comment on Whatever’s Left? I find it incredulous that anyone could think Feminism was anything other than a good thing. The very definition of Feminism is a desire for equality between the sexes. The desire to see men and women treated equally, hold equal station in life, in relationships, in work. To be paid the same and given the same benefits. Feminism brought us out of the dark ages, people fought, and died, to give women the vote. People gave up a lot to grant women equal pay. A fight led by trade unions that is actually still going on to this day. I’m at a loss to see how anyone can see equality as a bad thing, and as such I’m at a loss to see how anyone can see Feminism as a bad thing. We still haven’t achieved an equal society, that saddens me and shows me that Feminism is still an extremely important, and necessary, movement. I’m proud to call myself a feminist. 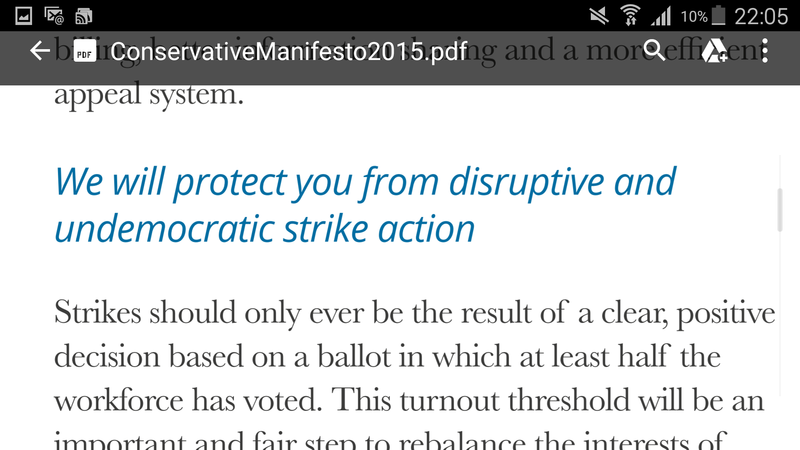 I imagine I’m not the only one who noticed the anti trade union section of the Conservative manifesto. The idea that people are being “protected” from strike action is a joke. The right to strike is the only thing that can guarantee workers rights. No one wants to strike, ever. By striking you lose your pay for the duration of the strike and you lose pension contributions. Strikers are often worse off for striking and it’s generally people in situations where they cannot afford to lose that pay who feel the need to strike. A need most often put on them back attacks on their conditions or on their wage. We will also repeal nonsensical restrictions banning employers from hiring agency staff to provide essential cover. This is the bit that irks me the most. Strikes only have an effect if the work stops. Strikers withdraw labour to show their bosses that they are, in fact, essential to the business and should be recompensed as such. By allowing these services to continue with agency staff the tories are completely negating the a ton and removing the only tool workers have to ensure they are treated fairly. The Conservative party have long been in favour of putting the big businesses, the rich, their donors, ahead of the people who work hard on floor. The fat cats in the ivory towers watch the money roll in while the people doing the hard work to make that money take home a pittance. They boldly spoke if trickle down economics, the idea that as the rich got richer they would start to pay more, but the reality is that the majority of the time as the big businesses get richer they find ways to pay their workforce less. Unions and strikes gave them some protection. Thatcher went to war with the unions, removed many of their rights and left them with a fraction of the power they had to stand up for their membership. New Labour failed to revoke these laws, but did at least leave them with some power. Tory plans will remove the little power the unions have left and leave workers no way to defend themselves. 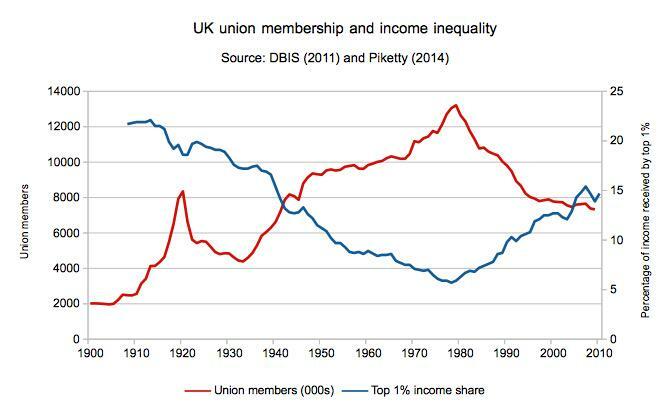 The share of the income of the top 1% holds an inverse relationship to the number of union members. It suits the tories, and their pals in big business that fund them, to kill off the unions once and for all.